I met Jeff Heer in West Palm Beach, Florida in 1994 where he was training with Mike Ferraro and Chet Raley at the Top Gun ski school. While Mike Ferraro was starting the boat and getting set to go, Chet Raley and Darin Shapiro both came over to me and said, “Tommy, you really need to watch this kid ride,” and they invited to come along. Jeff Heer was a few feet away unwinding his meticulous rope and getting into “the zone” for an extensive set with his new coaches. Excited to see what all the hoopla was about, I got my shoes off and jumped into the boat. 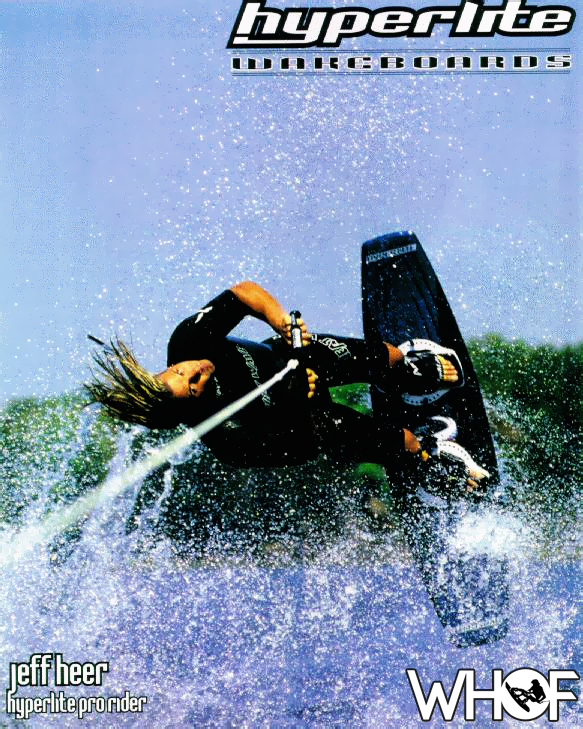 While Mike was bringing the 1994 MasterCraft ProStar up to speed, Jeff was carving and slashing and was completely in “the zone” as he cased the wake. Boom went his first jump, then his second and Ferraro said,” Tommy, this guy is really, really good.” I watched in amazement as Mike and Jeff worked together and Darin and Chet were cheering him on. By this time, I was a new believer and just knew that something special was unfolding right before my eyes. “Where was this kid from and just exactly who was Jeff Heer?” I said to myself! Later that week with Mike Ferraro’s nudging, I had Jeff Heer ride a prototype board that was designed by Stuart Barton out of both ends of Darin’s new board, with many modifications, of course. Jeff gave me so much critical information that turned out to be “spot on.” He knew the water and the water was so familiar to him, especially with his family’s background from so many water sports disciplines. Jeff Heer set a very, very high bar and mentored many of the great Canadian riders of the early days and he still continues to influence the great riders of today. 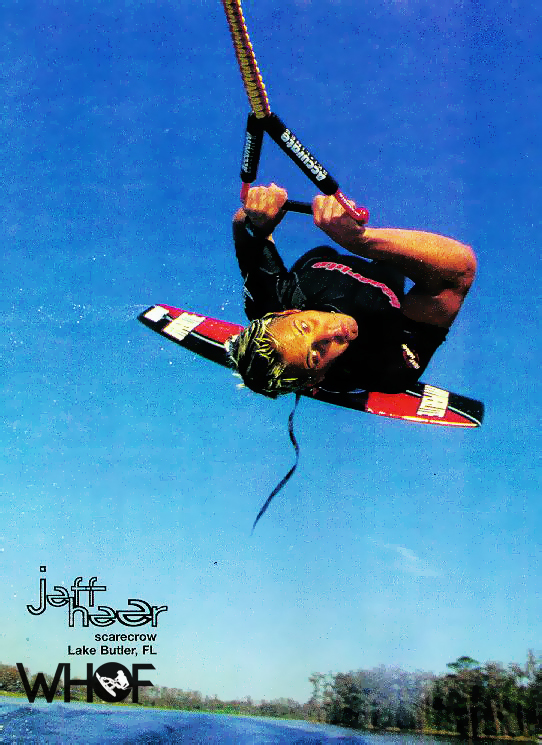 When the Wakeboarding Hall of Fame started, Jeff was one of the first historic riders contacted. He has more stories of riding and things nobody knows about in Canada along with the rich and storied history of Canadian Wakeboarding than anyone else. The Wakeboarding Hall of Fame will continue to pry out of him as much as we can. I hope all of you get to know more and more about this Legend of Wake as the stories unfold. Here in his own words is our first of hopefully many historic interviews with wakeboarding legend, Jeff Heer. (WHF) Jeff it is an honor to have you tell us about your life in wakeboarding and watersports. Please take us back to your childhood and what it was like growing up in Canada and having such a short season on the water. (JH) Thanks Tommy. I grew up in Richmond, British Columbia, which is a suburb of Vancouver. My parents always had a cabin on Lake Samish in Bellingham, Washington that we visited every weekend. It is a beautiful lake that is great for all water sports. The weather was definitely colder than Florida but we could be in the water from March to October so it was a pretty good season and when you’re a kid the cold doesn’t bother you as much. I would think a little differently now! I was into everything including water skiing, riding a disk, jet skiing and just being in the water. Growing up in Canada was great. I loved having two seasons, one to be in the mountains and one to be on the water. 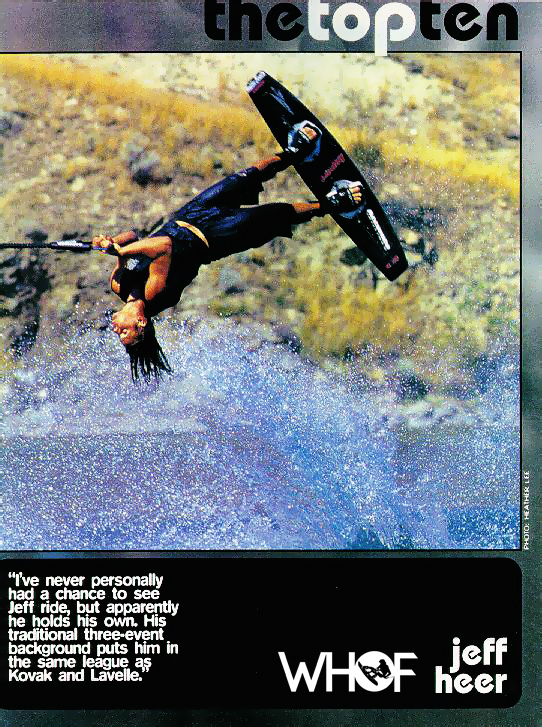 (WHF) Jeff your parents were incredible supporters of you and the entire wakeboarding movement and they were involved in the business of boats and watersports too. Tell us what it was like at your home in Canada and how both your folks influenced you so much. (JH) My parents always supported me on anything I wanted to do. They never pushed me on anything. When I was young they would send me to Florida to ski with Mike Ferraro to get some early training before the season started in Canada. I don’t know if that was their smartest move! My parents had a distribution company for water sports brands. They carried brands like Liquid Force and Connelly. They also were a Malibu Boat dealer. It was always fun around them because we had so much to talk about. It’s pretty funny that they sold those brands and Hyperlite and MasterCraft were my primary sponsors. It made for some great dinner discussions. All in all, it was great having my parents so involved with the sport. (WHF) How did traditional water skiing play into you becoming a wakeboarder and were there political conflicts when you changed focus? (JH) I started as a water skier. It’s a great sport and I learned a lot about being on the water. I was heading to Florida to ski with Jeremy Kovac and he called me and told me to bring a wakeboard. Jeremy and I started riding and that was the end of water skiing for us both. I loved the fact that wake boarding had no rules and you could just make stuff up as you went. There were a lot of politics at the beginning between wakeboarders and water skiers but that only lasted for a couple of years. Some people supported what was happing with wakeboarding and some hated it. The people that hated it were jealous of wakeboarding. So much was happening so fast in the growth of the sport. (WHF) What was the first wakeboard you ever rode and where did you get it? (JH) The first wakeboard I ever rode was the Skurfer Launch. That board was really fun but I’m glad that compression-molded boards came out later. (WHF) When I met you in Florida in West Palm Beach at Mike and Chet’s school you were young but very talented. How did their coaching change your wakeboarding trick list and how did it play out on tour? (JH) That’s funny! I remember meeting you at the Top Gun Training Center – I think that was the name. Both Mike and Chet were awesome in different ways. They were both really good at teaching new tricks, but Chet was better at helping you put a run together that worked and would get better results in competitions. Both of those guys helped me learn and they taught me the correct way to get through the early rounds and also how to get better results in the finals. My wakeboarding definitely went up a lot of levels with their help. (WHF) Your early runs were off the charts with all kinds of mobes. How the heck did you learn such difficult tricks and get them all in your runs on tour? (JH) In the early days of competitive wakeboarding, we had to turn in a trick sheet that would tell the judges what we were planning to do. It required five tricks per pass and you got twenty-five seconds to make it all happen. With that format it was easy to figure out how to get the best results. All you had to do was to look at the list of the ten highest point value tricks and those were tricks that I did. The highest point tricks were always mobes and s-bends so, to get better scores those were the tricks that I included in my run! Learning the tricks was always the fun part. It was a real accomplishment when you learned something new. Mike helped me to learn almost everything. Sometimes he would push so hard that you had no choice but to learn the trick or he would leave you in the middle of the lake and make you swim back. We had some good fights over that but I always learned the trick that he was trying to teach me. When it came to putting tricks in a run I never had a problem with that. I would say that as a kid my competitive trick skiing helped me a lot. All I had to do was figure out what trick set you up for the next one the best. (WHF) How much did you hang out with the other early Canadian competitors like Kreg Llewellyn and Jeremy Kovak? (JH) I hung out with both Jeremy and Kreg but Kreg lived in Orlando so I didn’t see him that much. Jeremy and I rode and hung out together every day. We were and still are great friends. He was great to ride with because we pushed each other hard. I can truly say that we had the best time of our lives. We were doing what we loved to do and definitely living the dream. There are some unbelievable stories that I will tell you sometime in private but they definitely can’t be shared here! All I can say is that we got in our fair share of trouble. (WHF) Fast forward to today. Who else from Canada deserves a mention and had influence on you as a young rider or still has influence on you today? (JH) Wakeboarding has been so good to me. I have meet so many great people and made so many life long friends. I wish I could list them all but I can’t. First of all I want to thank my family, Herb and Paul O’Brien, Mike Ferraro, Chet Raley, Terry and Ron Goodman, Bill Porter at Performance Ski & Surf, Hyperlite, Aarne Clow at MasterCraft, Chad Sharpe, Jeremy Kovak, Mike McComb and, of course, you Tommy. Thanks for this article and everything you are doing for this site. (WHF) In closing, it has been amazing watching you all these years. You were part of the golden years of wake and we are so proud of you and all of the Canadians that helped take our sport to the next level. God bless.